Our synthetic sports flooring is an homogenous, solid and highly flexible surface commonly used in recreation centers or facilities that accomodate social functions for which hardwood is not suitable. Synthetic flooring, referred to as "pad and pour", combines a base layer of shock absorbing pad and a series of pours made of polyurethane layers. This flooring is generally applied over a flat concrete surface (such as a tennis court or gymnasium) or over a pre-installed recycled sub floor. Synthetic Flooring can be used for a number of multipurpose applications including offices, wet areas, exercise rooms, indoor courts, child play areas and dance floors. Durability and cost vary depending on the application. Knowledge of the expected usage patterns will help us identify the right flooring so that you can keep costs down and increase satisfaction. Gymlastic Jog n' Walk Indoor Track Surface 3/8"
The Jog n’ Walk 3/8" indoor track system provides the resilience, shock absorption, and traction .. 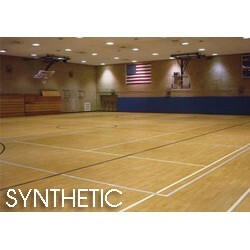 The Gymlastic multi-purpose sports floor is an environmentally friendly, multi layered system com..